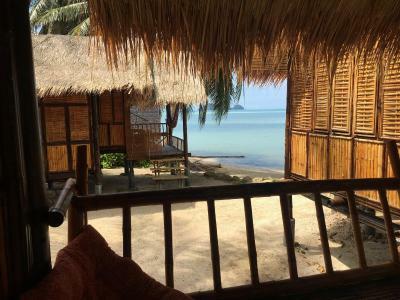 Lock in a great price for Castaway Beach Bungalows – rated 9.3 by recent guests! The castaway team takes great care of its guests and helps them with everything! From booking boat trip to finding the perfect beach for the guests needs. Proximity to the hinkong bay. The resort feels like being in a movie pirates of the Caribbean , rustic feel yet the bathroom was by far the best I had ever experienced in a wooden bungalow. The place is well looked after, inside out. 5 star to the owner who is making sure customers will have the best experience. Mark was super friendly, the breakfast was great and the location was lovely. Martin, the owner of the bungalows is such a great person... He does everything possible for his guests to be comfortable! The chalet bungalow that I stayed in is very simple and small; so go for it if you are for a very simple stay.. I loved the bungalows! They were perfectly advertised, the location was good and they were very well maintained. Also Martin and Penny were very helpful and friendly. It was lovely spending time on Ko Phangan with them. The breakfast provided was excellent and also the beach was very quiet. Definitely not the most touristy location, but we were not looking for that. The location made the 3 day holiday seem like a full week of rest. The owner is English and moved us into one of his friends newer bungalows which was great! Thanks for sorting it, we really enjoyed our stay! Castaway is a little paradise on Koh Panghan. The huts are simple, but good and the view (and sunset) is amazing. The owners are super friendly and more than willing to help. We also liked to hang out at the Freeway bar next to the huts, which has a very cool vibe. It was a great start of our holiday and we can’t wait to go back! Very nice quiet spot with great access to nearby bars, restaurants and beaches. The staff is absolutely amazing. Cozy place with great view. Martin is kind and helpful. One of our best sellers in Hinkong! 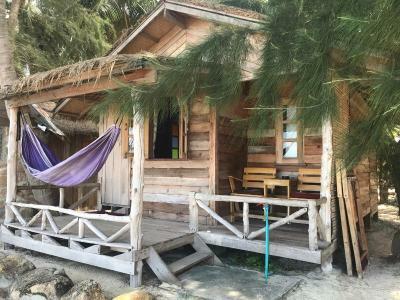 Located just right on the beach, Castaway Beach Bungalows are built in a traditional wooden style. Guests can enjoy spectacular sunsets and an amazing view of Anthong Marine Park from every room. 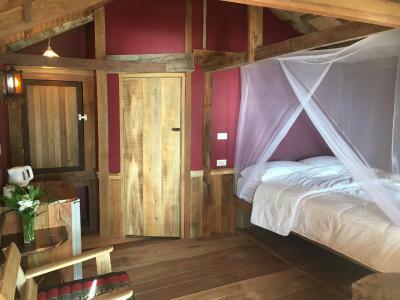 Every bungalow features free WiFi, a four-poster bed, fridge, fan, western style bathroom and a private balcony with an essential hammock. 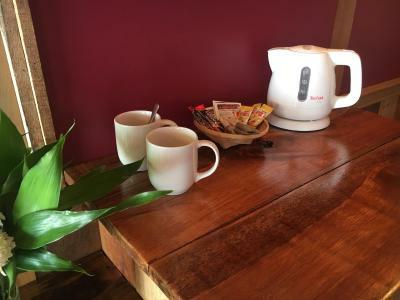 The on-site coffee shop serves breakfast and a large selection of coffee and tea. The property is located in Hin Kong area, a few minutes drive from Thong Sala Pier. Guests can enjoy the safe shallow beach. Driftwood built FreeWay Bar, can be found next door. This property also has one of the top-rated locations in Hinkong! Guests are happier about it compared to other properties in the area. This property is also rated for the best value in Hinkong! Guests are getting more for their money when compared to other properties in this city. When would you like to stay at Castaway Beach Bungalows? This chalet has a balcony, sea view and seating area. 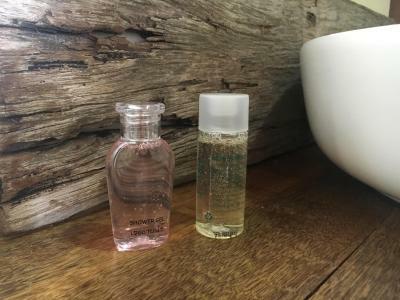 House Rules Castaway Beach Bungalows takes special requests – add in the next step! Great location on fantastic beach under coconut trees, located between Thong Sala and beaches, close to restaurants and store. Great and helpful owner. This place is a dream. Beautiful and clean but directly at the beach. No air conditioning. But are 2 fans in the room. No blankets on the bed but I'm sure if we had asked we would have been given one. Only stayed for 2 nights and second night was full moon party so no need. Martin and Penn were super helpful in every way!! Location on the beach is great and close to a few great restaurants where you can eat and watch the sunset. Also right beside a funky wee bar "freeway bar". Bed had a great mosquito net which helped you sleep more at ease. We rented a motorbike from Martin and he mapped our day out for us telling us which beaches to go to - would recommend doing that! > It is really hot without the air conditioner. When it is warmer than 30 degrees outside we could not sleep a minute in the night. > Additionally we had some friends in the bungalow like a gecko or a cockroach. > One thing we found a bit strange is that we got our motorbike without any fuel and that we have to fill it up bevor we could drive anywhere. Of course we gave it back with a lot more fuel because we did not drive a lot. And we have talked to other guests and everyone of them told us the same. They got the bike empty and gave it back full. The host is very friendly and helpful. The beach directly in front of the Bungalow is a dream! But you can only swim in the morning because about noon the water will be very far away. The breakfast is great and cheap! Nothing about Castaway, everything was great !!! After 5 days in Koh Samui, Castaway was a breath of fresh air. The place has this little something special, which makes you completely disconnect from the moment you put the foot there. Martin and his wife were top, always when we need a few things, no pressure - as if you were at home - and a super taxi driver Mr Dang - ohhh so much fun with him, I miss him so much !!! - that I really recommend to anyone like us who does not want to take any risk on a scooter. I had an incredibly good croissant aux amandes for breakfast (and I am French !!) 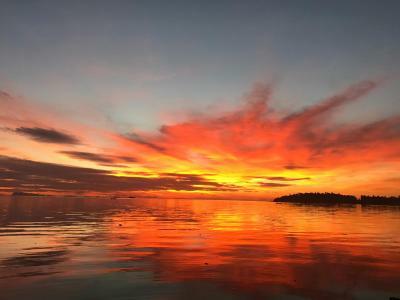 You will not see more beautiful sunset on Koh Phangan... So many good vibes ... I will be back !!! There was nothing to complain about! 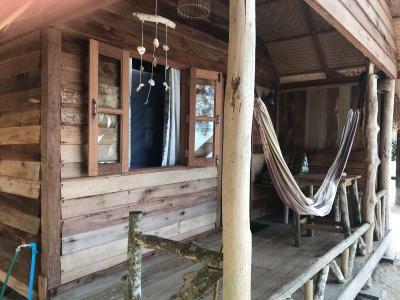 I’m angry with myself that I didn’t book more days at his self-made bamboo bungalows! Martin & his wife wife were the best hosts I ever met. He cares about his guests a lot and helps you out with a lot of cool advices around the island to make your stay as perfect as possible!! Staff were excellent, very welcoming and helpful throughout our stay. 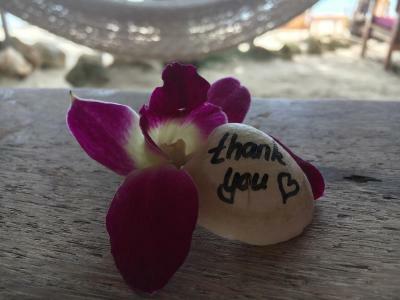 We felt the staff went above and beyond to make the experience of staying in the bungalow as personal and calm as possible The bungalow was incredible and location was a paradise. Very easy to relax on the busy island. 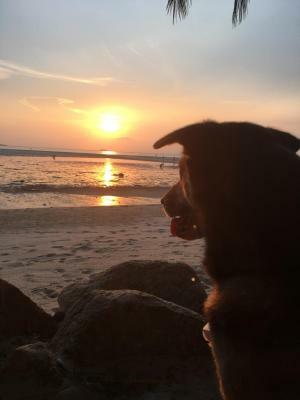 We would definitely stay again if we were to visit Koh Phangan again. Tranquil and magical vibe. Martin and Pen are exceptional hosts and can’t do enough for you. Breakfast was legendary and very well earned 5 star reviews. The coffee was great as was everything. Great location, bars and restaurants close by. 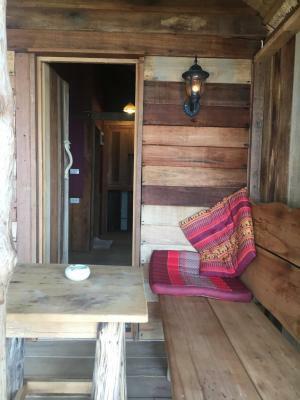 The rooms are small but beautifully arranged, a little oasis against the clutter of Thailand. Sunset views fabulous.